In economics, shrinkflation is the process of reducing the size or quantity of a product while the price of the product remains the same or slightly increases. In some cases, the term also indicates the lower quality of a product or its ingredients while the price remains the same. The word “shrinkflation” is a combination of the words shrink and inflation. British economist Pippa Malmgren is generally credited for inventing the term in 2009. The phenomenon is quite common in the food and beverage industry. 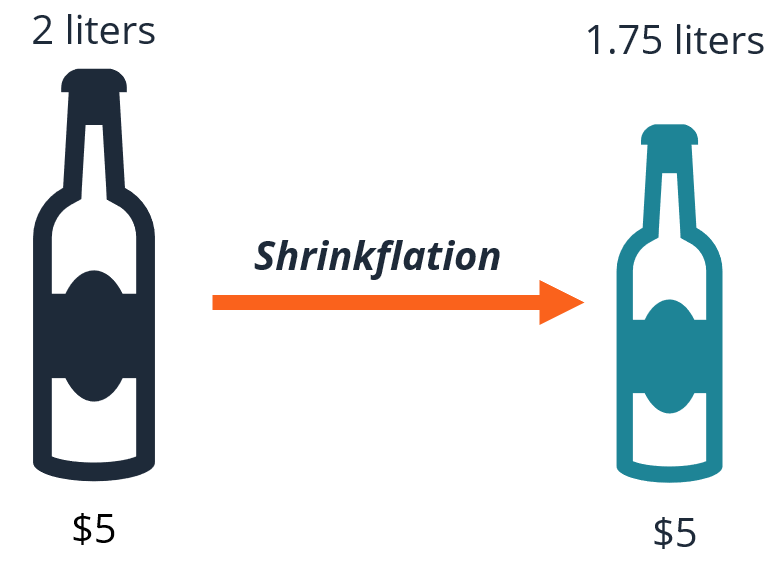 Essentially, shrinkflation is a form of hidden inflationInflationInflation is an economic concept that refers to increases in the price level of goods over a set period of time. The cause for inflation in the short and me. Instead of increasing the price of a product that would be evident to consumers, producers reduce the size of products, and thus raises the price per unit of weight or volume. The small reductions are usually unnoticed by consumers. Shrinkflation is mostly used by the producers in the food and beverage industry whose consumers are concerned only with the price of goods and less concerned with their quantity. Note that the shrinkflation cannot be viewed as a fraud or misrepresentation of products. Conversely, producers always indicate the weight, volume, or quantity of their productsConsumer ProductsConsumer products, also referred to as final goods, are products that are bought by individuals or households for personal use. In other words, consumer on packaging labels. Rising production costs are generally the primary cause of shrinkflation. Increases in the costs of ingredients or raw materials, energy commodities, and labor raise production costs and subsequently diminish the profit marginsProfit MarginIn accounting and finance, profit margin is a measure of a company's earnings relative to its revenue. The three main profit margin metrics are gross profit (total revenue minus cost of goods sold (COGS) ), operating profit (revenue minus COGS and operating expenses), and net profit (revenue minus all expenses) of producers. Higher products prices may negatively affect consumers as they may turn to cheaper products. However, reducing the weight, volume, or quantity of the products while keeping the same price may improve the producer’s profit margins (by lowering the production costs). At the same time, the average consumer will not notice the small reduction; thus, the sales volumes will not be affected. Fierce competition in the market also causes shrinkflation. The food and beverage industry is generally an extremely competitive one, as consumers are able to access a variety of available substitutes. Due to this reason, producers look for options that will allow them to keep the favor of their customers and maintain their profit margins at the same time. Coca-Cola: in 2014, Coca-Cola reduced the size of its bottle from 2 liters to 1.75 liters. Toblerone: in 2010, Kraft slashed the weight of Toblerone bars from 200 grams to 170 grams. Tetley: in 2010, Tetley reduced the number of teabags sold in one box from 100 to 88. Nowadays, shrinkflation is a common practice among producers. The number of products that undergo downsizing increases every year. Large producers in the European and North American markets rely on the strategy to maintain the competitive prices of their products without significantly reducing their profits. At the same time, shrinkflation can frequently lead to customer frustration and deteriorating consumer sentiment regarding the producer’s brand.